Based in London, Morven Jones joined Nomura in October 2008 after 15 years at Lehman Brothers and is Managing Director and Head of EMEA Debt Capital Markets Origination. 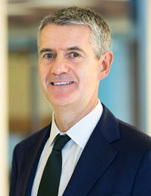 Previously, he worked in Lehman Brothers Debt Capital Markets group in a number of roles including Head of European corporate client coverage and Head of sovereign, supranational and agency coverage and spent three years from 2005 as Chief Operating Officer for Lehman Brothers' Investment Banking division in Europe. He has extensive experience in the capital markets having worked on financing transactions for the world's major public sector and corporate borrowers including BP, Carlsberg, Diageo, GlaxoSmithKline, GDF Suez, RWE, Shell, Vodafone, Agence France Tr�sor, UK Debt Management Office, Belgium, Netherlands, Portugal, the World Bank, KfW, European Investment Bank, European Financial Stability Facility and European Stability Mechanism. Prior to joining Lehman Brothers, Morven worked at Credit Suisse First Boston in London. He holds a BSc in Management Sciences from the University of Manchester Institute of Science and Technology.